MADISON, WI– At the Library Mall, there is a food cart named Zen Sushi that serves homemade Japanese cuisine. In this 10-by-12-foot wooden cart decorated with hundreds of origami paper cranes, Megumi Lohrentz hopes to make the world smaller by comforting her customers with homemade food she prepares every day. For eight years, 49-year-old Megumi and her 75-year-old mother have worked diligently to serve their costumers with love. They serve their fresh homemade sushi rolls and hot dishes, including flavorful beef curry and unique Nagasaki-style chicken, to the UW-Madison community. 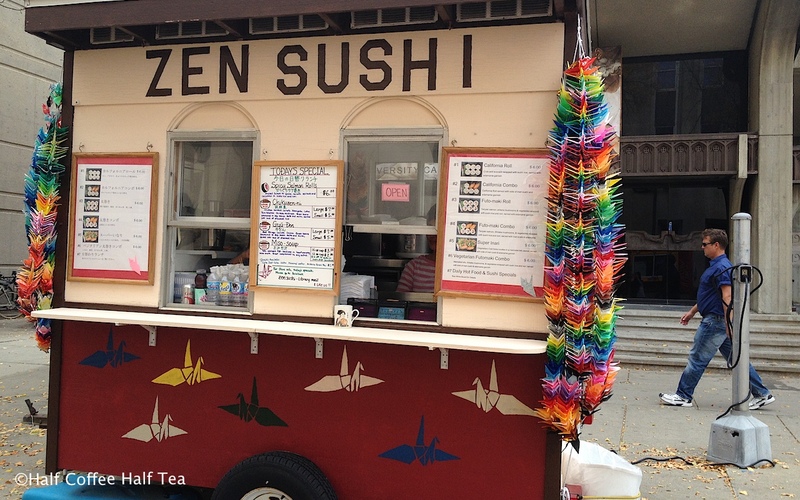 The Zen Sushi food cart has always been ranked as one of the top 10 food carts at the Madison Food Cart Review. Zen Sushi is very popular among the UW’s Asian population-students not only from Japan, but also Korea, China, and the rest of the continent. Megumi’s home cooked dishes have more vegetables and less meat fat than Asian food that’s prepared in the restaurant. It also has simple and healthy elements that can only come from home-cooked Asian meals. “I always come here to get my lunches because Megumi is very nice and kind,” says Jiean, a third-year student at the University of Wisconsin-Madison. Jiean came all the way from China to study in the United States. Jiean says that he is a regular customer at the Zen Sushi food cart because the food here reminds him of the food his mom would cook. Before making Madison her home and pursuing her passion for cooking, Megumi traveled a lot and moved back and forth between Japan and the United States several times. Born in Japan, Megumi came to the United States for two years with her family when she was 11 years old. Later in her sophomore year in college, she returned to the United States and met her American husband, David Lohrentz, at a small college in Kansas called Bethel College. They married a year after meeting. They then both moved to Japan and taught English for four years. They decided to switch jobs, because as an American, David’s salary was much higher than Megumi’s salary. Instead, Megumi became an interpreter and her husband decided to pursue a Ph.D. in Comparative Culture at the University of Wisconsin-Madison. They moved back to the United States and settled down. As a full-time interpreter, Megumi had to travel 40 weeks a year. Being away from home so much, Megumi missed her family. Traveling was never a pleasant experience for her because she was always put in an extra inspection while going through customs. The September 11th incident gave Megumi the final push to quit her interpreter job. She decided to stay with the family by opening up a food cart business. 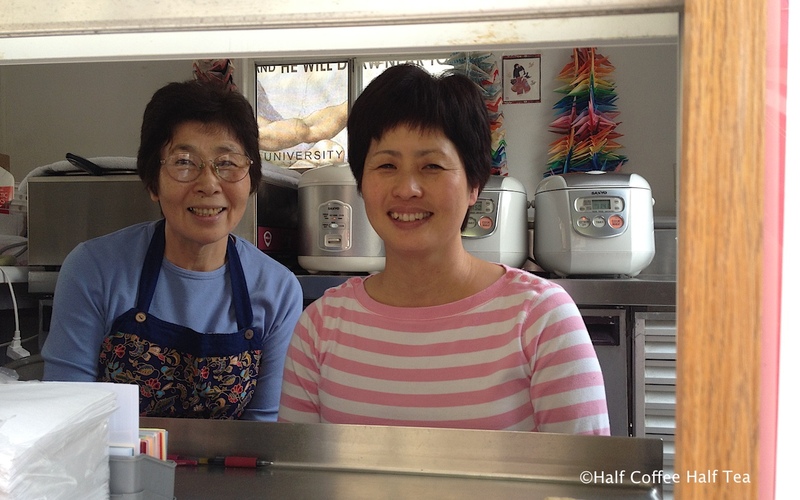 Megumi was attracted to the food cart business because she loves cooking, and opening the food cart at the Library Mall also allowed her to stay with her two daughters and her husband. As an interpreter she went to 23 different countries and 43 states, form her travel experience, she believes that people are the same no matter where they came from. “I do not believe in culture and country boundaries, I don’t believe in citizenship,” said Megumi. 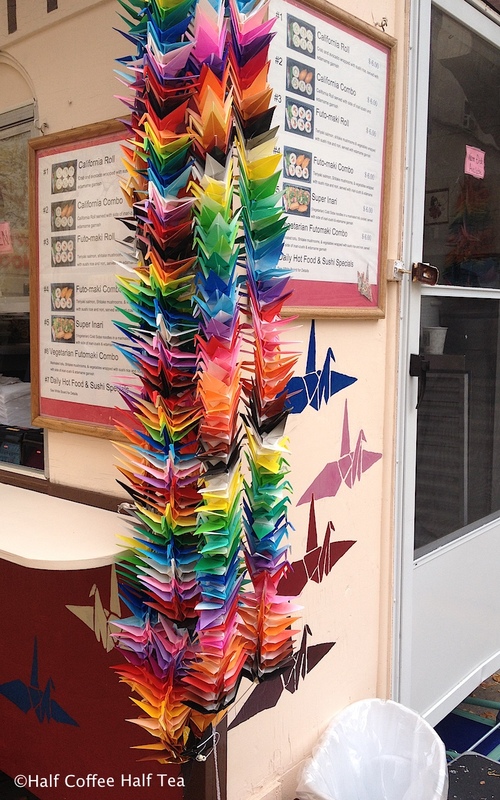 Therefore, she hung paper cranes by her food cart to symbolize peace. She hopes that people can be more acceptable and understandable to other cultures besides their own. Megumi’s passion in food and her hope to comfort people with her food also deeply influenced her husband. After finishing his Ph.D. degree in the University of Wisconsin-Madison, David bought the American bread company at the Capital Square called Madison Sourdough in 2010. He hopes to make Madison Sourdough into a communal oven for people to gather for nutritious bread, cakes, pastries, and more. Other than working in the food carts during weekdays, Megumi also works at the Madison Sourdough to help her husband on Saturdays. However, her dream is to open up her own restaurant one day. Until then, Megumi and her mom kindly greet customers and serve fresh homemade meals that are prepared starting as early as five in the morning. She also posts the daily specials and weather conditions on Facebook to give her customers a heads up with what to expect for the day, just one example of how much she cares for her community. Today’s specials are spicy salmon rolls, chikuzen-ni, Gyu-don, and miso soup.